Partnership FRAC of Pays-de-la-Loire and association The biennial of Plastic arts. 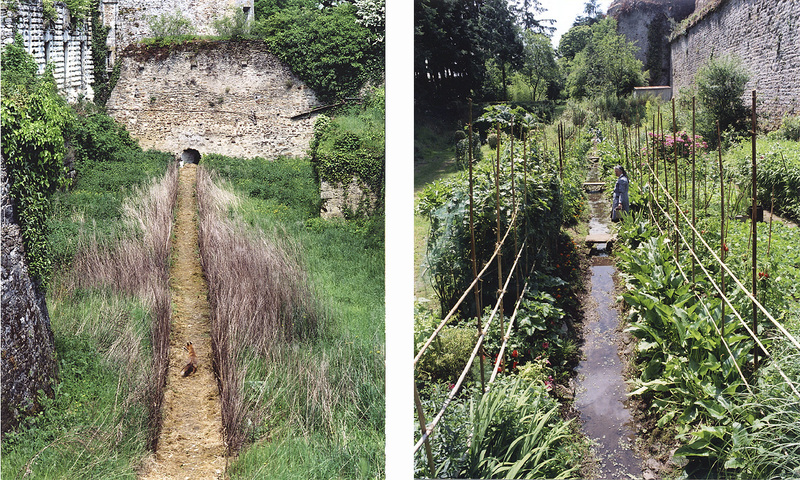 Situation: Two sites in the rests of the moat of the castle among which one is a dry waste land and other one, a kitchen garden crossed by a stream. 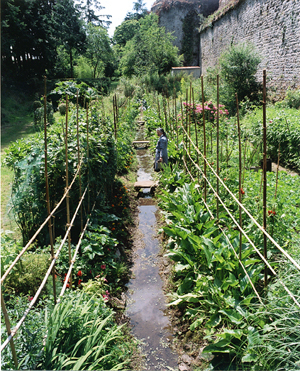 Materials: For the track, rederal waste land on bed of debris, stems died from Common Lampsane, for the kitchen garden, of the compost, bamboos taken from the site, nets of protection, French beans, cabbages, celery, salad, tomatoes, aromatic: mint, sage, angelica, and flowers: carnations of indigo, petunias, verbenas - With a fox seated with straw for the production and sister Anne-Marie's participation from the retirement home. Dimensions: Internal Moat: about 55 m of long by 4-5 m of wide - external Moat: about 35 m of long by 3-4 m of wide. Collaboration: Association of the castle of Blain, Biennial of Contemporary Art at the school, FRAC of Pays-de-la-Loire, Matthieu Quiniou, FEC Notre-Dame retirement home of la Groulais.